There are enough things to worry about each day in the business world without being concerned about snow and ice. However, businesses in the New England area must deal with this each year or risk losing customers. Rhode Island hardscaping and landscaping providers often offer these seasonal property services to clients. Snow removal in Northern Rhode Island and Southeastern Massachusetts is vital to the ongoing success of any business. Whether you have customers or employees that need to get into the parking lot, Rhode Island snow and ice removal is key. In addition to providing landscaping and hardscaping design in Rhode Island, Eastern Landscaping also offers a variety of seasonal property services. Ice and snow removal in Northern Rhode Island is frequently used by commercial businesses, including retail shops, office buildings, and service providers. Imagine trying to get HVAC trucks out to take care of broken heaters, but they can’t get out of the garage. Working with experienced Rhode Island snow and ice removal services can help to keep driveways, parking lots and other surfaces clear. One of the biggest reasons why businesses need the services of Rhode Island hardscaping and landscaping year-round is to protect them from liabilities. Snow and ice can quickly become dangerous hazards. All it takes is one trip or slip on an icy sidewalk, and you could have a serious lawsuit on your hands. Employees, customers, vendors, and other visitors are at-risk for slips and falls if you don’t properly clear your parking lots, sidewalks, driveways, and entries. It is important to work with Northern Rhode Island snow and ice removal services to clear your property as soon as the storm hits your area. Sure, you could have your in-house maintenance crew take care of ice and snow removal in Northern Rhode Island and Massachusetts, but there are some drawbacks. First, you would need to provide proper training for your staff to ensure that they are removing the snow and ice safely and according to OSHA regulations. 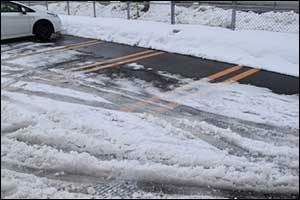 Second, you would need to purchase professional snow removal equipment beyond the basic shovels and picks. If you don’t have the right tools, it could take all day just to clear the sidewalks and entryways. Snow plows, blowers, and removal equipment are required to clear a parking lot properly. Another reason to work with services that have experience with hardscaping design in Rhode Island is that they will protect your hardscaping. Hardscaping includes any ground cover that is not organic or living matter. Sidewalks, walkways, paths, entry areas, parking lots, patios, and common areas should all be cleared of snow and ice. Allowing snow and ice to build up on these hard surfaces could lead to additional breaks and cracks before spring. When the service you work with also maintains your hardscaping design, you can rest knowing that they will take good care of it. If you don’t clean asphalt properly or if you don’t use the right equipment and tools on it, it can quickly become damaged. It is important to hire seasonal property services that have the training and experience necessary to protect your surfaces. When done incorrectly, you might end up spending thousands of dollars to put in new sidewalks, driveways, and parking lots. Don’t trust your commercial snow and ice removal to just anyone. Make sure you hire a professional team that will provide proper snow removal in Northern Rhode Island and Southeastern Massachusetts. One of the biggest benefits of contracting with Rhode Island snow and ice removal services is knowing that it is being handled. You can enjoy the snowfall at home with your family and not be concerned about the parking lot at work. You can spend the weekend sledding or ice skating with the kids and not worry that employees will slide on the sidewalk Monday morning. Contracted services mean that crews are dispatched to your property to clear and protect your business as soon as the storm hits. Teams are ready and available 24/7 to make sure that your driveway is clear before you open up for business. If you are interested in learning more about ice and snow removal in Northern Rhode Island or Southeastern Massachusetts, call Eastern Landscaping. Our team will come out to your property and provide a NO COST estimate for all of our seasonal property services. We can even help you with landscaping and hardscaping design in Rhode Island when the snow melts. Give us a call at 401-766-9035 to speak with one of our customer service agents. Visit our website to see our full list of property maintenance services for commercial and residential clients.